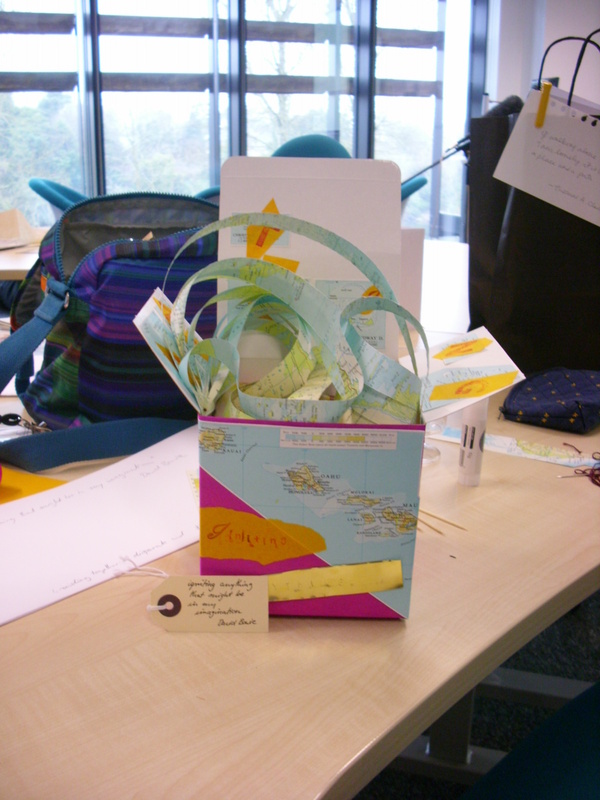 Last Friday’s Look, Make and Learn event at the University of Huddersfield for me ended up as a reminder of ‘flow’ – and the joy of having time and space to just explore. Sarah Williamson started us off with a session on “Bookmaking for visual thinking, recording and reflection”. As readers of this blog will know reflective bookmaking is a wonderful tool of exploring thoughts and while working on mine (not quite finished yet, but see below for some pictures of its current state) I realised how long it has been since I actually took the time to make one. Sarah started us off with nice and easy by showing us how to make an Instant Book (sometimes also called Beak Book) out of an A3 photocopy of a map. (If you want to make your own Instant Book, check out the first page of this guide.) She also explained why we were using a map and not blank sheets of paper (and a pale map at that): it takes away the fear of the blank page. A blank page seems to suggest to the maker that it needs to be filled up with perfect stuff, while really this is all about process. Using a texture or pattern as a background will then help with what comes after it. A pale map is perfect for this, as it provides a background that can be worked into. We then moved on to the Concertina Book (also called the Accordion Book) out of a long strip of paper. (If you need instructions on how to make your own, check out this page – we didn’t put covers on ours in the session, but there is a simple way of doing that included here too.) And in order to get rid of the blank page again, Sarah had brought in two random pages for each of us, one from a music guide and one from a DIY manual, and challenged us to find some words or phrases that explained why we decided to join the day, cut them out and stick them into our books. The whole process can be riddled with ‘creative’ errors. It can happen that some strategy, unfit to reproduce the original ‘vision’, ends up outputting something completely unexpected, yet intriguing. a celebration of real things. The next session was led by Chrissi Nerantzi and called “Make It Yourself (MIY)”. This was a very fast-paced session that took its starting point in the question whether learning (and thinking) that is only ‘head-based’ can ever work – even at university, which seems to have a very head-based tradition of theory rather than practice. We all filled a paper heart with what we love about teaching and then exchanged these hearts and discussed the ones we (randomly) received in small groups. Then we were sent out in pairs to fulfil tasks ranging from talking to students to finding useful objects around campus. We ended up in a circle making a physical net by throwing a ball of wool to each other, sharing feedback on the session. After lunch I led a session entitled “Playing with Genre”. Here small groups had 30 minutes to design a board game based on writing an essay. We ended up with four games that we discussed and compared to some examples that students had put together in class for me. This is a great way of getting students to talk about what they perceive to be their strength (becoming short cuts) and weaknesses (becoming obstacles), as well as their expectations. I had planned to talk a bit more about how the board game genre also has the potential to become an alternative to the schedule of classes in the module documentation, but while there I realised that this might not have been that interesting for most of the people present as it is quite specific to people who actually plan whole modules. This might become a more detailed blog post in future… or maybe an event on its own (let me know if you would be interested in this!)? Liz Dixon and Judith Kidder rounded off the day with a session on “Using LEGO® Serious Play® (LSP) in teaching, learning and research”. I had heard a lot about this, but had not actually done this myself. We did three short tasks – building a sculpture showing our role at work, a recent teaching experience, and then remodelling the latter into how that could have been improved. I particularly liked the remodelling, as it made me think about not just what I had done, but reflect on how I might change it for next time – something I probably would not have come up with if I hadn’t seen the sculpture in front of me. Liz and Judith emphasised the three steps of kinaesthetic learning, reflective conversation and written reflection (which we didn’t have time for, but that ideally should follow these tasks as part of the learning process) – and how important it was to free your mind of the literal interpretations. Judith said that this sort of metaphocial modelling is a different way of communicating and that it is a way of unfolding different possibilities. In a way this brought the day full circle for me – my reflective book had been filling up throughout the day and I had added my Instant Book to the Concertina Book, so there is now some unfolding going on when reading through it. It has a thread running through it (inspired by the net-building wool), which at some stage writes ‘flow’ – something Sarah talked about at the beginning of the day. Refolding the combination of Instant and Concertina book made this word appear on the ‘cover’ page – and it is also a good way to sum up a great day! Join us for this collaborative University of Huddersfield and ALDinHE regional ‘Look, Make and Learn’ event, exploring visual teaching and learning tools and practices. If you are seeking creative inspiration, practical activities or new ideas, then this event is for you! For further information (including full details of the workshops) and to book a place at this FREE event, please follow this link: https://aldinheregionaleventatuoh.eventbrite.co.uk. Please be aware that places are limited and will be offered on a first come first served basis. The subject of two of Mike Rohde’s books, The Sketchnote Handbook and The Sketchnote Workbook, this is a term he coined for visual note taking, really a combination of note taking and sketches, or maybe better for the use of sketches to augment note taking. I am a big fan of taking ‘notes’ through collage (something I was introduced to by my friend and colleague Sarah Williamson currently at the University of Huddersfield, and we have tested this out and published on it here), but that is not always possible or appropriate. 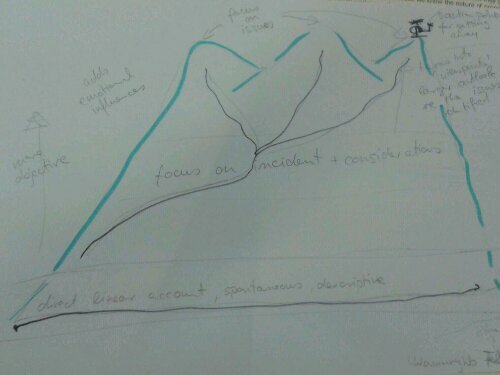 So trying out drawing as part of the note-taking process seemed a good next step (or maybe a good compromise). I had read through (not worked through) both of Rohde’s sketchnoting books within the last month, so I felt quite happy to just give it a go – making use of the paper pad and biro that were in my conference pack. And I have to say that I really loved it! It allowed me to take notes I am excited to review (plus two people at the conference mentioned to me how much they loved my notes when looking over my shoulder). I have already made another pass at them by adding some more colour – a good way of reflecting on the conference, and I do want to put together a retrospective drawing/document that summarises the themes that have come up for me at the conference. Of course there are some things this does not immediately afford: taking notes at a live conference you don’t necessarily know where the talks are going and you might commit to imagery that at the end makes less sense – or you might not know how much space to allocate. but I found it was a great way to keep my mind (and hands) engaged, even in talks I wasn’t that interested in. When comparing it to the collaging process, I don’t think it has quite the same potential to encourage reflection and discovery. The exciting thing about using collage is that the found materials you collage with provide an extra layer that your subconscious can latch onto and that allows you to develop your own thoughts on the material – or just with the material as a starting point. But that isn’t necessarily a bad thing, I think one of my reservations of encouraging students (particularly the ones who have just started their university career) to use collage is that it can take them very far away from the subject, using the sketchnoting technique on the other hand, might be just what they need to keep them engaged in the lectures, to encourage them to take their own notes – and then review them in preparation of the next session. After our December workshops had gone down quite well, Falmouth University invited Pat and myself back to this time put together a whole day as part of the Writing in Creative Practice series – Making Writing. We started off with making name tags in order to explore the materials available for reflective bookmaking – and I don’t think we ever had as many feathers to use before! Pat then started us off with an extended Writing Warm-up, which we used to explore writing on different textures ending up with writing about both objects and photographs. Again, a very rich experience to loosen us up (we didn’t really need to warm up as the weather was absolutely fantastic!). Nancy de Freitas then shared her expertise of coming to writing from a material studies background, talking about Writing and Materiality (Falmouth_workshop2) – starting us off with blue sky thinking, introducing the importance of having a working abstract when doing any sort of research project, the usefulness of questions to prompt where you are going, the utilisation of images in both abstract ‘writing’ and planning structure as well as the differences between personal and academic writing (yes, there should be one!). Nancy also shared some interesting thoughts on active documentation, and how that can be used to get students to think about structure and editing. After lunch Oliver West took over sharing with us his journey of how he developed the Footnotes project out of his own struggle with writing as a dyslexic student and then practcioner. This is based around taking notes on a simple folded grid – allowing visuals to be recorded, annotated and then reordered. And of course we got to have a go – and I saw Nancy’s shed make an appearance on not just my grid! I ended the official program with a gallop through the visual anaolgies and metaphors I use in order to engage my students with writing and particularly academic practice. Using the ‘mini’ quilt’ developed for the recent School of Education conference as a starting point, I introduced the framing of Kolb’s Experiential Learning cycle and then really briefly talked about The Land- and Seascape of Creative Practice, The Butterfly Challenge, ways of using objects, reflective bookmaking and poetic inquiry, The Dress-up Doll of Formality, visualising introduction/main body and conclusion of an essay as stages in journy planning, The Fishscale of Academicness, The Button Connection and The Winning Hand of Independence. And while I am not convinced all of them made sense with only a few sentences to explain them, I believe the gist of it came across – and I had some interesting feedback at the end of the session. We ended with a discussion round wondering whether approaches are different for practitioners and teachers, people who see themselves as more comfortable with words rather than images – and how we can make sure to cater for different learning styles of out students. 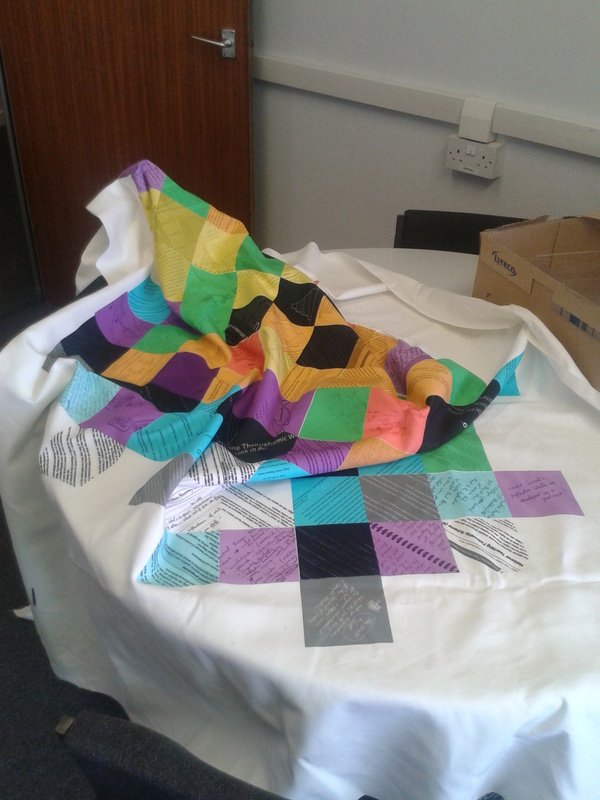 I experienced the Making the Textual Visual workshop at De Montford University on the 4th July as a wonderful sharing of ideas and coming together of different disciplines. Julia and Kaye not only had put together some lovely bright green bags for us, but also collected a lot of interesting and stimulating materials for collaging and to begin with making name badges. 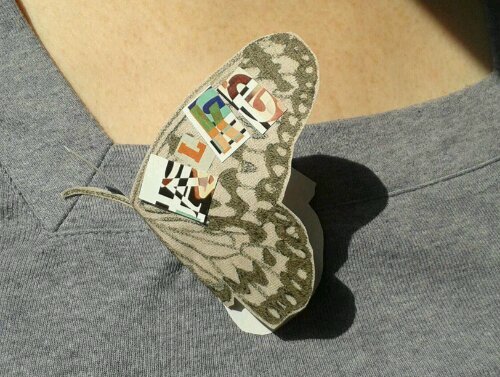 I found a lovely image of an embroidered butterfly, which not only reminded me of the Butterfly Challenge analogy I use with my students, but also of the idea of the quilt that I want to properly tackle this summer, so obviously I had to use that as my name badge! Julia and Kaye then started the day – and it was a very full house, I understand there was a very long waiting list of people who didn’t get in – talking about new ways of seeing and how they engage their students in contextual research as well as library skills. I particularly loved the new approach to re-framing, based on Pat Francis’ contextual circles idea this idea uses an image, like a postcard, in the middle of a poster (flipchart paper) and then gets students to work outwards filling ‘frames’ with answers to the W questions – what is is? who made it? where was it made? how was it made? etc. until they come to the all important why? and get to design a frame that surrounds their investigation. Julia described the success they have had with using this to get students from the descriptive to the analytical. Very inspirational indeed. Lisa Clughen then talked about writing as a social act – how important the conversations are, within your writing, about your writing, because really they are conversations about your thinking! She also gave us some examples of how she uses visuals to illustrate writing ‘problems’ to her students. My favourite of these was using the image of a cutlery drawer to get students to think about structure – a cutlery drawer is at its most effective when there are clear spaces designated for the knives, forks and spoons, just like as writing makes the most sense when the ideas that are linked are presented together and not in a jumble. I love this really simple idea of visualising structure… especially because most if not all students will be familiar with the concept of a cuterly drawer and also the annoying thing that sometimes happens if utensils are added that are an odd shape – haven’t we all needed to wriggle the potato masher so that we could open the drawer again? Well, in a way a writing problem can be just like that, and sometimes it just needs a little bit attention (the wriggle) to get it to fit the overall structure, so that we can close the drawer smoothly again! My own session was a brief talk about my use of post-its to organise reflection as a patchwork (as discussed on this blog under the ‘quilt’ tag). When agreeing to do this session I had hoped that this project would be much further along and that I could have brought a finished piece, but maybe the nature of it being in progress actually helped bring across the point… and a personal development mapping like this is, of course, never really finished. I was very aware that I hadn’t really looked at it for quite some time, and that it urgently needs updating before I continue working on it. However, it was nice to see how many of my dark green pieces, which I use to denote future plans, will need to be changed in colour, because I have achieved or at least further developed them! I got some great feedback and hope that I have inspired some of the attendees to start their own post-it patchwork as a tool for their personal reflection, maybe towards the HEA fellowship application. (And if you are one of these people, this blog wants to hear from you!) I will also try to write this up soon! 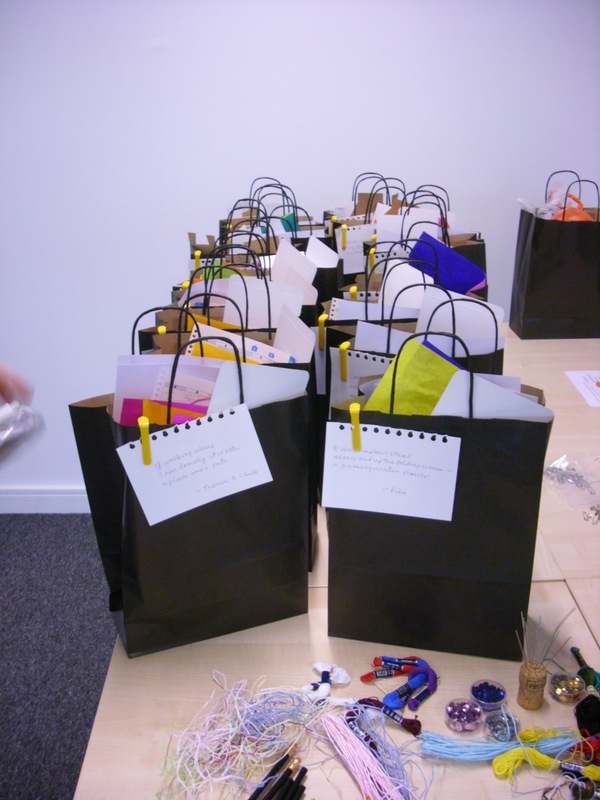 Through clever planning we then still had some time to do some making! So the tables made some posters using the strategies learned – and then shared what they thought had been most memorable. Here the collaging/reflective note-taking was mentioned a number of times and the (re)frames made a number of appearances, too. Overall a very memorable and enjoyable day. Kaye and Julia have been talking about having more events, to which I can only say: yes, please! help! 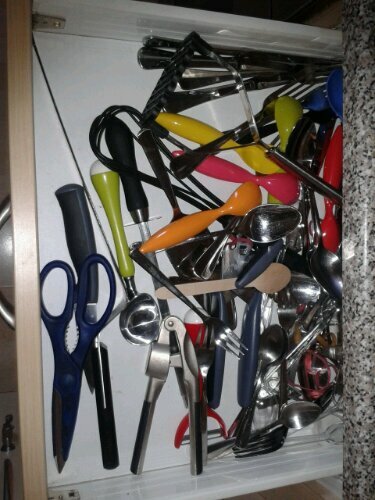 this is my cutlery drawer at the moment… not much structure at all! P.S. on a slightly worrying note I have taken a new look at my own cutlery drawer. On my list of things to do since I moved into my new flat (almost four years ago) was making a cutlery tidy out of old tea towels. Suffice to say this hasn’t happened yet… is this rather unstructured way of keeping my cutlery indicative of the chaos my research/life feels in at the moment? So last week, Sarah and myself made our way to the first Writing in Creative Practice workshop to be held in Scotland. We had been invited to come to the Ayr campus of The University of the West of Scotland by Alison Bell, who had been at the very first of these workshops in Stoke-on-Trent, and we had been talking ever since to make this happen. The idea behind the programming of the day was to particularly look at collage, but more in the direction of reflection than the recent Chester workshop had been, which was very much about interpretation of text I felt. And of course we had set it up so that participants could have a go themselves. Intitially (after making our own name tags), Sarah introduced reflective notetaking in book form, with a particular look at poetic inquiry and its roots in Dada (as well as referencing the songwriting of David Bowie). After lunch, Alison shared her experiences of working with collage as a methods of enquiry as part of her PhD. This was a very thought- and personal reflection on her work, which (for me) particularly made the point that it is not only the collages that can be interpreted, but that taking photographs of them then allow their interpretations from mutliple perspectives, again changing what one is able to see in them (and in extension in the work). The next part of the day was given over to just that exploration of words in not just two but three dimensions. Brigid Collins introduced us to her work on poem houses, and with the help of some handy template boxes, participants were encouraged to take their two dimensional collage into the third dimension. Brigid had also given everybody a haiku as a possible starting point. A really intensive working period followed, where people were working on both two and three dimensional visual reflection. To bring everybody back to the university context, I then introduced a way of using collage as a way of thinking about collating a literature review, and particularly for explaining to students the difference between a literature review and an annotated bibliography (something I seem to have trouble at in my teaching). I will blog about this in more detail soon. In order to collect feedback, we used an activity that Sarah had recently tried with her students: we gave everybody a page of notes from the back of a found book of a greek play (I think), asking them to pick out three words and expain how these three words reflected their experience of the workshop. Because the notes were quite academic and sometimes included translations of greek and latin terms, the found words were really interesting and the feedback in places was almost lyrical. Overall it was a great day – on our way back we were already making plans on a future event, so keep your eyes peeled for that (though of course it might take another year for that to actually happen…). Here is a picture of my ‘poem house’ (slightly unfinished as yet). It was inspired by a David Bowie quote in a video clip Sarah showed: “igniting anything that might be in my imagination” and a Conquergood quote that popped up in Alison’s presentation “braiding together of disparate and stratified ways of knowing” (2003). I liked the idea of igniting and found a map of islands at least some of which I thought might well be volcanic, and liking the idea of braiding things together, I cut them into strips according to the longtitude. So far I didn’t do any braiding, but that might still come!